New to Florence? Hungry for a really real food experience? Are you daring and a little nutso? Social Dining is for you, you daredevil you! Heard of social dining? Have hang-ups? Ok, disclaimer: I’ve been told by several chefs and hotelier friends that Indians don’t like to ‘eat with strangers’. I’ve also heard that even though plenty of options exist in urban locales, the concept is pretty slow on the pick up. Are you falling into that category? Lets talk about this for a second. Think about meeting new people, not from your office or your yoga class or people who’ve tagged along with your friend for Ladies Night. Just regular people who probably like you, live to eat. You spend the evening learning about their lives, their hopes & quirks and their fascination for Bruce Springsteen tattoos. Isn’t that a better escape from your life than watching a Salman film? Or stalking someone on Instagram? Or even visiting the statue of David? Most regions have their own cheeses, wines and sometimes even vegetables. If you travel from south to north, you’ll notice a distinct shift in flavours, ingredients and even attitude towards food. Take something as basic as pizza – if you were to chase it across the country, you’ll notice that up north and in the central regions, the crust is very thin, but it becomes significantly thicker by the time you reach south. Almost Dominos like. So what’s the best way to taste authentic regional cuisine with really local people? 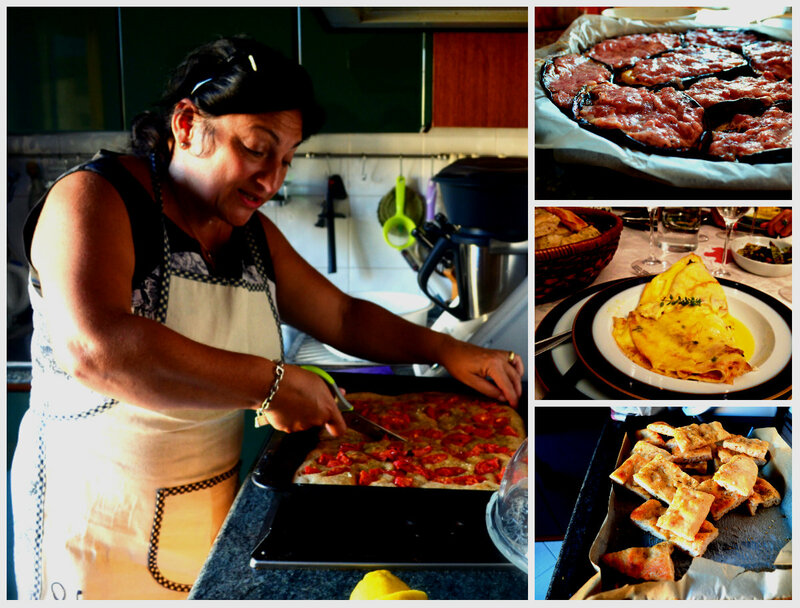 Eat at a typical Italian home and you’ll think twice about eating at a restaurant or cafe. Think of a dining experience at your grandma’s home and now think of eating the same food at a fine dining restaurant. Get the picture? And that’s how I met Pat. I am going to walk you through my experience with social dining, and hopefully by the end of it, you’ll be inspired to give it a shot yourself. Or atleast consider it. Eating with Patrizia was like dining with your favourite aunt who sends the best birthday gifts and gives you all the dope on your mother’s college life over a glass of perfectly chilled Prosecco. And then shows pictures of all your mum’s dopey boyfriends, as a bonus. 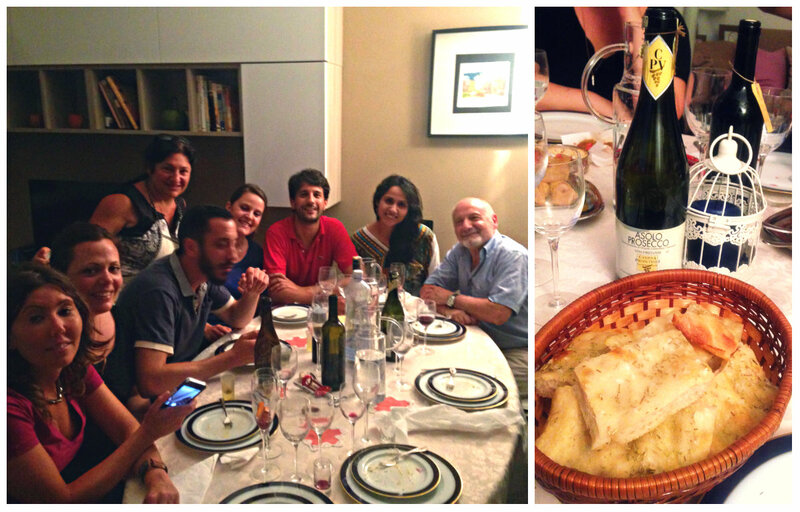 Since there were no existing events during my dates in Florence, Pat was kind enough to organize a dinner party in-keeping with my request of ‘eating with locals’, she created an event and invited fellow Tuscans. Step 1, completed. Now I showed up early to Pat’s home, and I highly recommend you do the same (assuming ofcourse your host agrees) You get to hang out more intimately and the quality of your conversations will be life changing. Guaranteed. And as a bonus, you can badger him or her for recipes and they’ll just have to oblige (cause there’s really no one else to annoy them yet). Honestly, I hadn’t accounted for how well I’d get along with Pat. It was one of the most touching interactions I’ve had in my entire trip. It reminded me of why I travel – To connect, be awed and stuff my face. Ofcourse. Speaking of stuffing, that’s what we did to the cannoli shells – with tuna. And toasted eggplants till the kitchen was hot-boxed with gooey melting cheese…something football and nacho fans would be proud of. Bliss. I had to exercise a great deal of self restraint to stop myself jumping into all the food cooking, baking, mixing and melting infront of me. I didn’t want Pat to know that am actually a gluttonous pig in the guise of a girl with long hair. Not yet, of course. Really, this should be your social dining motto. As the other guests trickled in, I noticed they were a mix of young and (well) aged. The table featured a good mix of professions, regional backgrounds and wine preferences. And what do you know, most people were dining with strangers for the first time. And were just as anxious as everyone else! We discussed politics, cuisine, humidity in Asia, use of Indian swear words and how ‘ananaas’ in both languages is indeed pineapple. Between plates of food and stories of adventure, I looked around the table and realized that this was pretty simple and a lot of fun! Like cheese stuffed crust. Step 4: Reward your daredevil self – Chow it down! This is really the moment you and I have been waiting for. 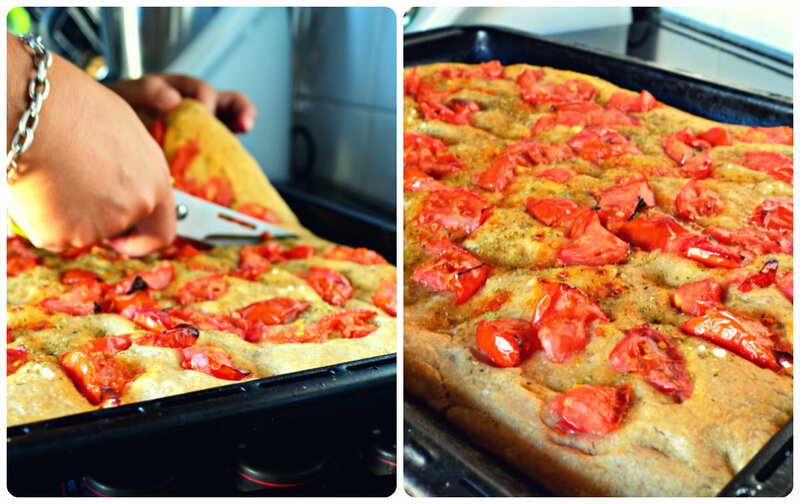 Two words ‘Buon Appetito!’. I’ll give you three – ‘you’ve earned it’. The dinner was entirely homemade, down to the breads and pesto, even herbs from Pat’s garden. The meal featured an array of antipasti, a delightful main of Crepes Val d’Aosta style (a valley in north west Italy where cheese is the primary produce) and a lovely dessert (Rollé with chantilly cream & fresh cherries) ending with a delicious homemade limoncello. But for me, the hero of the table was this simple tomato and sourdough antipasti. Soft and bready with just the right amount of freshness and chewability. Pat later shared her recipe with me – which you can find here on the follow up post. – Choose your host wisely. 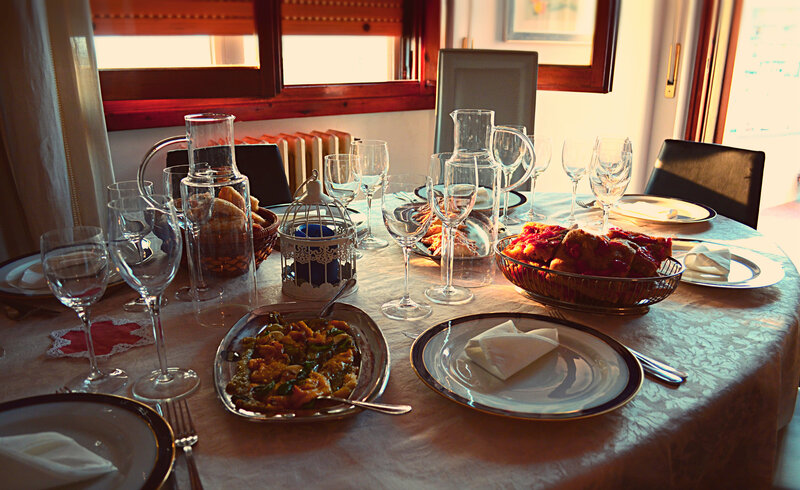 You may do an Eatwith experience or a Secret Supper with one or more hosts, the key to your experience will be the host. This person will be going the extra extra mile to make you feel comfortable and make the entire experience memorable. Check out you host’s background, testimonials from other diners, pictures and experience in the kitchen. This will tell you everything you need to know. – Enquire about the other guests. Not in a creepy, stalkerish manner. But get a general sense of age, gender breakup and professional diversity. The quality of your experience is directly proportional to these factors. Ask yourself – do I see myself fitting in? Am I likely to benefit with my interactions at this event. It’s perfectly alright to be selfish here. – Are you paying an appropriate amount for this experience? Good question (I’ll pat myself on the back, thank you) Two factors should dictate this – the experience of your host (i.e the amount of time they’ve been cooking & hosting) and the quality of food (does the menu sound proportionate to the money you’re spending? Or would you spend this amount eating similar food at a reasonably priced restaurant?) If you’re checking yes or mostly maybes on both these fronts, the experience sounds worth of your money. – Be safe – If you’re travelling alone, the location of your meal is important. Very important. Find out about the neighbourhood, fix your mode of transportation; especially if it’s likely to go on late at night. I was graciously dropped back to my hotel by a fellow guest cause bus services had ended for the day. Don’t hesitate to check these things with your host. – And finally, drop your inhibitions. Remember, no one on the table knows you (unless you’re there with a plus one). Break ice by speaking on common subjects that can get the entire table talking (instead of the two here and two there conversations you’ll notice) I realized that food, language, other social dining experiences, popular art & cinema are great people integrators. So loosen up, chill and enjoy yourself. Because really, everyone is just like you. Ishita! Congrats on the new blog! Oh how I wish I could have eaten with you! I have been very curious about “Eat With”- now I shall have to try! I’d add something to your point about “Are you paying an appropriate amount for this experience”- I think people should also factor in the host’s time and labor, plus the personal touch involved! Since I’m in a similar industry, I just couldn’t help but add my 2 cents…teehee. Love your voice, hope to see you again! Hi Coral, so good to see you here! Thanks a lot for your support. You’ve made a very relevant point – Pat did slave for about 3 days to make the meal and she went out of her way to make everyone feel so comfortable..
Look fwd to your post on social dining 🙂 Hope to see you here again soon!